Today concluded my first week of medical school. I was so overwhelmed by the sheer volume of material that we have to learn. As I was stressed over this, my mind thought about my beloved Lord Muruga and how I was serving Him at the Thiruchendur Murugan Temple. I then fell asleep as I was very tired from all the reading. That night, I was greeted by Sri Ganesha and Sri Murugan. I found myself in a temple with the puja about to start. I recall hearing the temple bell ringing signalling the devas, Gods, and the people within the temple that temple worship is about to start. Since I had just arrived, a little boy (Murugan?) came to me, grabbed my right hand and said,"Hurry, hurry! You are going to miss the worship!" He was pulling me into the direction from where the puja was supposedly in progress. Then the boy quickly ran away and came back to me. He presented to me a whitish-yellow coloured veshti (lined with a red border) for me and helped me to put it on. Then He pointed me in the direction that the puja was taking place. When I went to that location, the first thing that I saw was a nice statue of Lord Skanda seated on His Myol. It was very much like the one that Gurudeva has in His Hawaii Kadavul Temple (see figure on left). 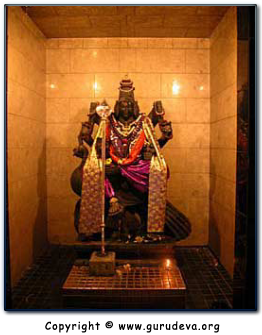 Sri Skanda's pose and attire was identical to the picture on Hilda Charlton's book except the form was a black vigraham (statue). He was wearing a yellow veshti with a red shalwey around His arms. He looked very lovely. My attention was then drawn to my right where a priest was pouring honey and milk into a kumbum (tumbler). He mixed the two by shaking it and then walked to my left (past the Murugan statue) and gave the milk-honey preparation to the head priest. The head priest took the tumbler and poured it over a statue. It was Lord Ganesha! He was receiving an abishekam with honey and milk. 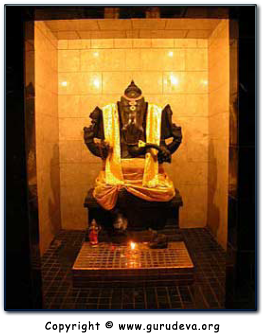 He looked exactly like the little white Ganesha statue I have in my prayer room, except for that this statue was black. The priest then took a katpooram (camphor) pancha-aarathi (lamp that holds five camphor) that was lit by the assistant priest and held it to Sri Ganesha. I closed my eyes and prayed. When I opened my eyes, I awoke. Thank you my Lord for you and your kind brother to come and bless me during my 1st week of medical school. By your grace and blessings, may I complete my studies faithfully and do your service through healing your children. Aum Sri Maha Ganathipathayae Namaha! Today I went to visit Gurudeva's website (www.gurudeva.org) when I was greeted with wonderful pictures of God Ganesha and God Skanda (see below). It was then when I realized that this was the vision I had on September 19, 2002. The subtle goldish tone of the light and atmosphere, the size of the statues, the independent statues in their respective altars, etc. This was identical to all the things that I saw in my dream on Sept. 19.